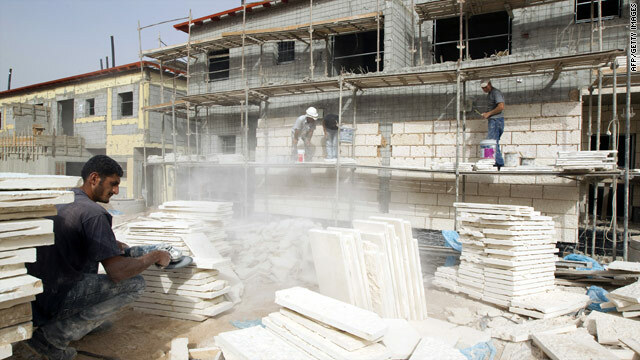 Workers build residential units last week in the Israeli settlement of Ariel, on the West Bank. Jerusalem (CNN) -- Israeli Prime Minister Benjamin Netanyahu urged Palestinian President Mahmoud Abbas on Saturday to continue peace talks after Palestinian leaders called for a halt to the talks unless the Israelis stop settlement construction. "The way to reach an historical peace between our two peoples is to sit around the negotiating table seriously and continuously and not to leave it," Netanyahu said. Palestinian leaders meeting in the West Bank on Saturday backed a halt to peace talks with Israel if it does not freeze settlement construction, a Fatah official told CNN. Leaders from the Palestine Liberation Organization and Abbas' Fatah movement met in Ramallah to discuss the direct peace talks between Israel and the Palestinian Authority, said Mohammad Dahlan, the Fatah official. A stumbling block to the continuation of the talks could be Israel's settlement activity, he said. An Israeli settlement construction freeze expired last Sunday, and the Palestinians have said they want it extended or they will leave the talks. Israel, however, has not yet agreed to reinstating it. Netanyahu said the Israelis had carried out a series of gestures to initiate the negotiations and that Palestinians held direct talks in previous years during settlement construction. The Israeli Prime Minister said he hopes Palestinians will "continue the talks to reach a framework agreement within a year." Officials in the negotiations -- including U.S. special envoy to the Middle East George Mitchell -- have been working for a compromise on settlements. The Palestinian leadership said it blames Netanyahu for any failure of the talks. The issue will be discussed at an Arab League meeting next week. Meanwhile, U.N. Secretary-General Ban Ki-moon called Mitchell and the Israeli and Palestinian leaders Saturday. A United Nations statement said Ban renewed his hope that Israel would extend its settlement restraint policy to help create a conducive environment for successful talks. "He reiterated his belief that negotiations are the only way for Israel and the Palestinians to resolve all final status issues and realize their aspirations," the statement said.